I’ve always been a go-getter. Growing up, there wasn’t a girl’s soccer team, so I played with the boys. And after I ditched my dream of becoming a professional soccer player, I set my sights on a career in business. I went to Yale and then I got my MBA from Wharton. After I graduated, I was hired as an Analyst at a consulting firm. Many caffeine-fueled days and nights later, I was promoted to Senior Analyst. I thought all my hard work had finally paid off. That is until I saw a sheet of paper that had been left on the printer. The sheet listed the names of salaries of everyone in the company. Lo and behold of the six Senior Analysts, I was the lowest paid … by far. As I looked at the list, I started fuming. Many of my counterparts had less education and less experience than me. But they had one thing in common: They were all men. Now, I knew about bias and gender gaps in the workplace – like how women make only 78 cents for every dollar earned by men. I never in a million years thought it would happen to me. But I had the evidence in black and white. And the question was: What do I do about it? I decided to say nothing and instead do some research when I got home from work. After a quick online search, I came across Negotiation Strategies for Women: Secrets to Success, a free special report from the Program on Negotiation at Harvard Law School. While Harvard is my alma mater’s biggest rival, I decided to give the report a try. Inside, I found out why women sometimes ask for less. In fact, the average college-educated woman earn $713,000 less over the course of her working life than her male counterpart, according to the Coalition of Labor Union Women. I began to think back to my initial salary negotiation: Had I not asked for enough? – The real deal – While there can be gender differences in negotiation, the results refute the theory that women are naturally less skilled or aggressive negotiators than men. Rather, the tendency of women to ask for less than men in certain settings may be a self-protective strategy based on a very real threat of being penalized for behaving contrary to deeply ingrained gender expectations. As I read, it all started to make sense. But what was I going to do about my current predicament? To close the gender gap and avoid a backlash when negotiating on their own behalf, women should try to link aggressive demands to the needs of others, such as the organization’s. When making requests, women should reference relevant standards. In addition, organizations should attempt to control the insidious effect of gender stereotypes by instating salary benchmarks based on objective performance measures. Armed with my newfound negotiation strategies for women, I asked for a meeting with my manager. In the meeting, I very clearly laid out how I was being under-compensated for my work. I also reiterated how my role was integral to the organization and our clients’ satisfaction. In addition, I used objective measures like billings to make my case for a fair salary. My manager agreed with me and promised to elevate the situation. Later in the week, we sat down with the head of human resources to discuss the gender gaps in our workplace. Because of the knowledge I gained in Negotiation Strategies for Women: Secrets to Success, I was able to outline some suggestions including instating salary benchmarks. At the end of the day, I got a well-deserved raise and my company took a big step closer to addressing gender bias. At the Program on Negotiation (PON) at Harvard Law School, we hear stories like Erica’s time and again. That’s why we’re dedicated to promoting negotiation strategies for women. Gender gaps in the workplace are a serious societal issue for both women and men. But you can help close them with the advice you find in Negotiation Strategies for Women: Secrets to Success. At PON, we don’t just give you theoretical guidance – we offer practical advice that you can implement right away. For example, our research on gender and negotiation has shown two approaches that have been proven effective. 2. The Power of Women Negotiators – The negotiator calls attention to her propensity to negotiate, identifying it as a key skill she brings to the company. In each of these instances the women negotiators signaled genuine concern for their companies and their relationships with colleagues – thereby inspiring collaboration. 1. Focus on negotiation skills for women. Women may be able to gain confidence and overcome insidious stereotypes by viewing negotiation skill as something that can be improved through practice – which it is – rather than as a stable personality trait. 2. Emphasize communal skills. When advocating for themselves, women negotiators can avoid backlash by stressing that they will negotiate just as aggressively for an organization. 3. Open doors. Organizations should actively connect women negotiators with high-status colleagues to help them access career opportunities that previously were closed to them. 4. Increase objectivity. To lessen gender bias in their organizations, managers can institute salary benchmarks based on objective performance measures. – Have a history of double standards where women negotiators are praised for advocating on behalf of their company but not for themselves? – Have far more male leaders than female ones? 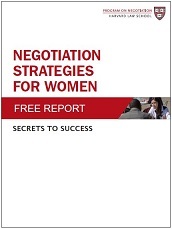 Then you simply must read Negotiation Strategies for Women: Secrets to Success. It contains the proven strategies you need to create an equitable culture in which individuals – both male and female – can reach their full potential. – Help female employees gain critical leadership and negotiation skills and help all employees confront gender bias and other obstacles to equality. Curated from several articles in Harvard’s Negotiation Briefings newsletter, this free report contains the insights you need to eliminate gender bias in the workplace. Download your complimentary copy now – you’ll be glad you did. P.S. A more equitable organization is within your reach. Combat the gender gap in your workplace with the strategies and tools you find in our free special report, Negotiation Strategies for Women: Secrets to Success. This is good and its the line of what I am doing I would to learn more about Negotiation Strategies for Women. Thank you for all the informative resources.